NHM Amravati (National Health Mission), Amravati Published Job Notification for 15 Specialist Doctor Posts. Candidates who wish to apply must look at NHM Amravati Specialist Doctor Recruitment 2017. Eligible candidates can join Walk-in Interview on 05-12-2017. 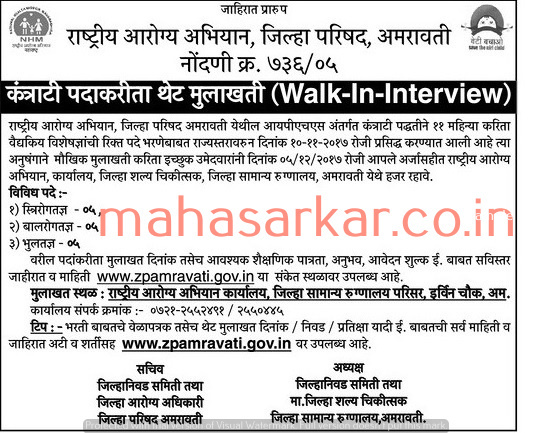 Interested & Eligible candidates may attend for walk in interview along with all the documents addressed at Rastriya Arogya Avijan Office, Near Jila Samanya Rugnalay, Irwin Chowk, Amravati.